This is an important decision that will have a positive impact on the dairy sector. One of the major challenges for manufacturers, importers and exporters in recent times has been that Codex has two sets of references for the additives that are allowed in foods: the commodity standards, which contain a specific list of additives for foods that are covered by the standards, and Codex’s General Standard for Food Additives (GSFA), which covers the additive provisions for both standardised and non-standardised foods. With consumers wanting to be more informed on what is in their food and manufacturers wanting to be clear about what is allowed to be added, having two legitimate but misaligned lists has been confusing and poses potential problems for international trade. Consequently, one of IDF’s priorities has been the alignment of the food additives provisions in the 27 dairy standards with the relevant food categories in the GSFA. The goal has been to harmonise standards to eliminate the confusion and trade disruptions created by the diverging provisions. The General Standard for Food Additives (GSFA) was created to be the sole source of additive permissions for international trade. For dairy products, only the Codex Standards for butter, whey powders and dairy fat standards were developed without a list of food additives but refer to the relevant food category in the GSFA. The current CCFA alignment work aims at achieving this for all commodity standards. IDF has long identified those issues that exist for dairy and thanks to IDF’s advanced work in this area which has involved extensive, detailed comparisons to ensure accurate alignment of additive provisions, CCFA agreed to consider the 13 Codex Ripened Cheeses standards in 2017. 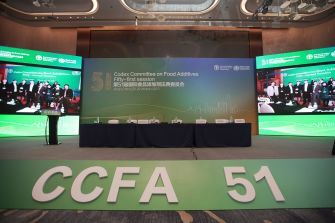 CCFA has now decided to move forward with these much-needed changes, provided final adoption at the Codex Alimentarius Commission in July. We are delighted with the progress on removing international trade barriers, and looking forward to working more closely with Codex on the dairy standards and other important issues for the sector.